Here’s a delicious yet healthy crockpot minestrone soup recipe. Start it in the morning then sit down in the evening with a nice warm bowl of soup. Great for those cold winter days! Cook on low heat 6-8 hours, or high heat 3-4 hours. 1 can of red or kidney beans drained and rinsed. Cook an additional 30-40 minutes. Add 1/2 cup of frozen, or 2 cups fresh spinach. Cook another 15 minutes then serve with garlic bread sticks. Our family LOVES minestrone soup! And I love that this is a crock pot meal! Pinning! Thanks Lindsey! We love minestrone too, good healthy soup and so easy in the crockpot. I love ordering minestrone soup when I go out for lunch at an Italian restaurant, it’s so flavorful and filling, but I’ve never tried to make it on my own. Pinning this, I need to add it to our menu options. In the colder months there’s nothing like a great soup to warm you from the inside out! I love the minestrone soup at Olive Garden, where you get all the soup, bread sticks and salad that you want. Mmmm so good! Hubby doesn’t like going there so now I can make my own. I love minestrone soup! My husband adds 1/2 lb of cooked ground beef or 1/2 lb of sliced keilbasa to it, too. So good! That sounds delicious too! I may try some ground beef next time. This is too funny. 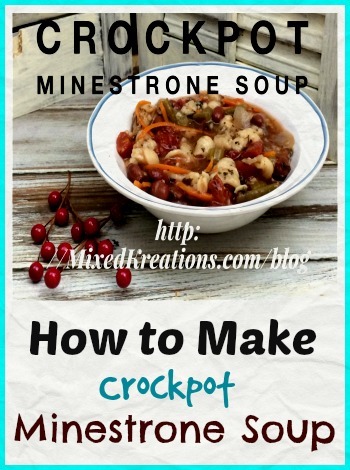 I just finished a blog post on my recipe blog for crock pot minestrone soup! How funny Carol. I will have to check your recipe out. I made this a while back and just finally finished my post. Perfect timing Linda, it’s getting chilly here in South Africa and Minestrone soup is one of my all time favorites, it’s so heart warming. I’ve never tried making one in a crock pot though. I’ll think we’ll try it this week, I’ve got most of the ingredients in the cupboard too. Thanks Michelle! I was a little leary about making it in the crockpot, but it turned out really good. I can eat soup anytime and this is one that I will fix over and over. Let me know what you think!